Anaplasma spp. are Gram-negative obligate intracellular bacteria transmitted by ticks. Even though numerous studies have detected DNA from Anaplasma spp. in the blood of birds, thus far mammals were the only vertebrates demonstrated to serve as competent hosts to these organisms. We report a novel candidate species of Anasplasma that was associated with cytoplasmic inclusions in the erythrocytes of an African penguin (Spheniscus demersus) in South Africa. Cytoplasmic inclusions were morphologically characterized from freshly-produced blood smears, and phylogenetic analysis of 16S rRNA and groEL genes were used to evaluate the evolutionary relationships of the organism to other Anaplasmataceae. Dark-purple round or oval inclusions consistent with Anaplasmataceae morulae were observed in the cytoplasm of erythrocytes. Phylogenetic trees produced using different methods agreed that the organism detected in this study belongs to the genus Anaplasma, and suggested that it is most closely related to the cluster comprising A. centrale, A. capra, A. marginale and A. ovis. We propose provisionally naming the strain detected in this study as “Candidatus Anaplasma sphenisci”. This is the first species of Anaplasma shown to produce cytoplasmic inclusions in avian cells, opening the possibility that cytoplasmic inclusions in avian erythrocytes that had previously been attributed to Aegyptianella sp. might in fact correspond to Anaplasma. Further studies on the molecular biology of avian-infecting Anaplasmataceae will be valuable to provide insight into the evolution and epidemiology of these organisms. Anaplasmataceae (Alphaproteobacteria: Rickettsiales) are Gram-negative obligate intracellular bacteria found exclusively within membrane-bound inclusions or vacuoles in the cytoplasm of vertebrate and invertebrate host cells . This family comprises five recognized genera (Aegyptianella, Anaplasma, Ehrlichia, Neorickettsia and Wolbachia) , and four candidate genera (“Candidatus Cryptoplasma”, “Candidatus Neoehrlichia”, “Candidatus Xenohaliotis”, and “Candidatus Xenolissoclinum”) [2–5]. The genus Anaplasma currently includes nine species, six candidate species as well as numerous unclassified species, all of which are either known or believed to be tick-borne (Table 1). Depending on the involved species, these organisms infect the cytoplasm of blood cells (erythrocytes, leukocytes or platelets), bone marrow precursor cells, or endothelial cells of vertebrates, forming pleomorphic clusters of bacteria (morulae) . Mammals are the only vertebrates demonstrated thus far to be competent hosts of Anaplasma spp., but numerous studies have detected DNA from Anaplasma spp. (especially A. phagocytophilum) in the blood of birds and in the tissues of ticks collected from birds [7–11]. However, no studies demonstrated the presence of Anaplasma spp. cytoplasmic inclusions within blood cells of birds, and it was therefore considered unclear whether these organisms are able to infect avian cells or merely remain viable in the avian plasma [10, 12]. On the other hand, cytoplasmic inclusions observed in the erythrocytes of birds have been traditionally attributed to members of the genus Aegyptianella. Currently the only recognized species of Aegyptianella is the avian-infecting Aegyptianella pullorum [13, 14], and the validity of other proposed Aegyptianella spp. remains unclear and the genus has been considered incertae sedis [1, 13, 15]. 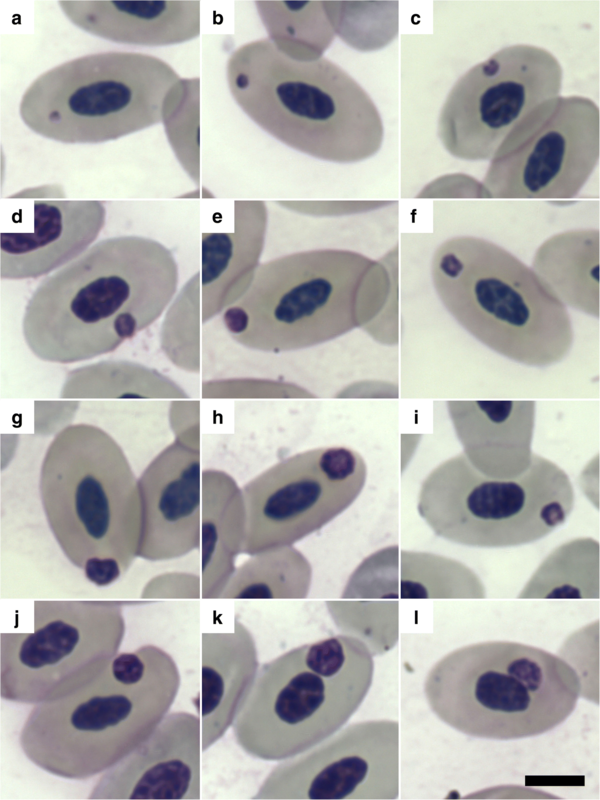 Aegyptianella pullorum infects the cytoplasm of erythrocytes forming pleomorphic inclusions with a diameter ranging between 0.3–4.0 μm, and has been demonstrated to infect chickens, turkeys, ducks, geese and quails [13, 16, 17]. A previous genetic study revealed that Ae. pullorum from turkeys is closely related to Anaplasma , leading some authors to suggest that Ae. pullorum should be reclassified as an Anaplasma [18, 19], but currently there is no consensus on this suggestion . In this study, we describe a novel candidate species of Anaplasma that is associated with cytoplasmic inclusions in the erythrocytes of the African penguin (Spheniscus demersus), and discuss the phylogenetic relationships of this organism to other Anaplasmataceae. The Southern African Foundation for the Conservation of Coastal Birds (SANCCOB) facility in Cape Town (33°50'02"S 18°29'29"E) receives and rehabilitates oiled, sick, and injured marine and coastal birds along the coast of South Africa. Cytoplasmic inclusions consistent with Anasplasmataceae were observed in the erythrocytes of an adult African penguin during the examination of blood smears as a part of routine veterinary checks. The individual history of the studied penguin is summarized in Additional file 1. Blood was obtained from the tarsal vein and thin blood smears were freshly prepared, fixed and stained with a modified Wright-Giemsa stain (Kyro-Quick, Kyron Laboratories, Benrose, South Africa). The percentage of erythrocytes with inclusions was estimated with manual counts of erythrocytic inclusions and software-assisted counts of c.2000 erythrocytes; erythrocytes were counted from photographs of 20 randomly-selected microscope fields under 1000× magnification using ImageJ 1.46r [21, 22]. ImageJ 1.46r was also used to measure the width of cytoplasmic inclusions. The following morphological characteristics were recorded for 100 erythrocytic inclusions: position (polar, subpolar, median), contact with host cell margins (contact with outer margin, contact with nuclear margin, no contact with margins), and the presence of adjacent indentation of host cell outer margin (present, absent). DNA was extracted from frozen blood using the DNeasy Blood and Tissue kit (Qiagen, Hilden, Germany) following the manufacturer’s instructions. A 927 bp segment of the 16S rRNA gene was amplified using the primers 8F and 1492R . A 939 bp segment of the groEL gene was amplified using a nested PCR with the primary primers HS1 and HS6 and secondary primers HS43 and HSVR [24, 25]. Amplification products were sequenced using Sanger bidirectional sequencing. MegaBLAST  was used to identify publicly-available sequences that were highly similar to those obtained in this study. Phylogenetic analyses of the 16S rRNA and groEL genes were conducted to compare sequences obtained in this study to publicly-available sequences of Anaplasmataceae (Additional file 2: Table S1). Sequences were aligned using ClustalW  as implemented in MEGA 7 . General Time Reversible model with invariant sites and gamma distribution (GTR+I+G) was used for both genes as recommended by jModelTest 2.1.10 . Neighbor-Joining trees (maximum composite likelihood, including transitions and transversions) and Maximum Likelihood trees (nearest neighbor interchange) were produced using MEGA 7; bootstrap values were calculated from 5000 replicates. Bayesian trees (two simultaneous Markov chains, 5 million generations, sampling every 1000 generations) were produced using MrBayes 3.2.6 ; posterior probabilities were calculated after discarding the first 25% trees as a ‘burn-in’ step. Phylogenetic analyses were conducted separately for each gene and also for concatenated (Neighbor-Joining and Maximum Likelihood) or partitioned (Bayesian) sequences of the two genes. Dark-purple round or oval inclusions consistent with Anaplasmataceae morulae were observed in the cytoplasm of 0.10% of the erythrocytes (Fig. 1). In most cases these inclusions had a dense and homogeneous texture with a slightly paler center (e.g. Fig. 1f), but in some cases it was possible to identify irregularly distributed dense dots or crescent-shaped areas (e.g. Fig 1j and 1l). The inclusions (n = 100) had a width of 2.28 ± 0.56 μm (range: 1.02–3.33 μm), and were positioned as follows: 46% polar (e.g. Fig. 1g), 39% subpolar (e.g. Fig. 1k), and 15% median (e.g. Fig. 1d). Most of the inclusions (75%) appeared to be in contact with the outer margins of the host cell (e.g. Fig. 1j), 7% appeared to be in contact with the host cell nucleus (e.g. Fig. 1l), and 18% did not appear to be in direct contact with any host cell margins (e.g. Fig. 1e). The outer margins of the host cell were deformed and a small indentation was visible in 63% of the erythrocytes where inclusions were in direct contact with the host cell outer margin (e.g. Fig. 1d and i). In addition to the erythrocytic inclusions, one lymphocyte contained dark-purple cytoplasmic inclusions (Additional file 3: Figure S1); however, despite extensive searching (> 1000 leukocytes examined), no other leukocytes or thrombocytes were seen with similar cytoplasmic inclusions and it was therefore not possible to determine the identity of these structures. Molecular detection of 16S rRNA and groEL sequences confirmed the presence of an organism belonging to Anaplasmataceae. MegaBLAST found that the closest publicly-available sequences were A. marginale (Genbank KU686794) with 96.8% sequence identity for the 16S rRNA gene and A. phagocytophilum (CP015376) with 78.7% sequence identity for the groEL gene. Relative to publicly-available sequences of A. pullorum, sequence identity was 89.1% for the 16S rRNA gene and 76.3% for the groEL gene. Phylogenetic trees of the 16S rRNA and groEL sequences differed in relation to the topology (Fig. 2, Additional file 4: Figure S2), but the different phylogenetic methods agreed that the organism detected in this study belongs to the genus Anaplasma, and that it is most closely related to the cluster comprising A. centrale, A. capra, A. marginale and A. ovis. Considering the host species and the phylogenetic relationship to other Anaplasma species, we propose provisionally naming the bacterial strain detected in this study as “Candidatus Anaplasma sphenisci” (derived from Spheniscidae, the family of the penguin host). The finding that mammals are not the only vertebrate hosts of Anaplasma advances the question of whether Aegyptianella pullorum should be reclassified as Anaplasma pullorum. Our phylogenetic analyses agree that Ae. pullorum, Anaplasma spp. 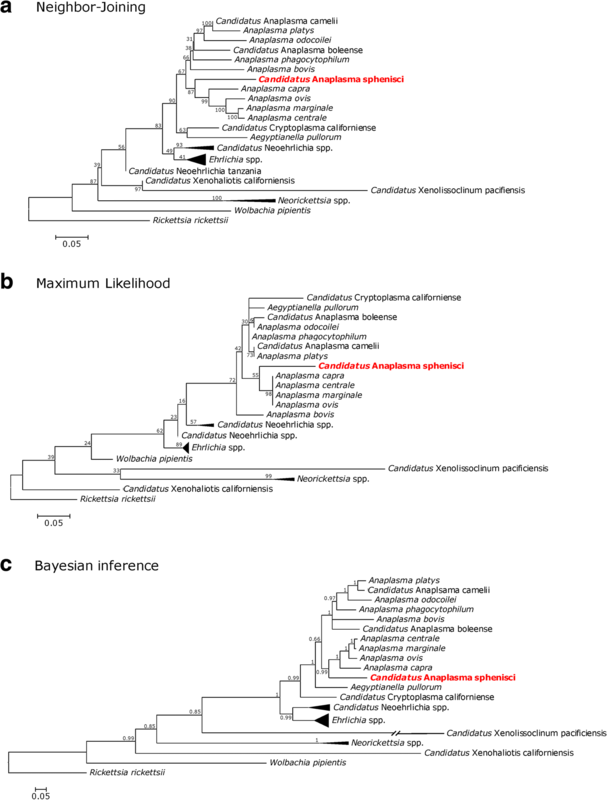 and “Candidatus Cryptoplasma californiense” are monophyletic; however, different phylogenetic methods disagree on the relationships amongst these groups (see Fig. 2 and Additional file 4: Figure S2). In the absence of additional information on the genetic diversity of other avian-infecting Anaplasmataceae, the question whether the reclassification of Ae. pullorum is warranted remains unresolved. The fact that Anaplasmataceae-like cytoplasmic inclusions have also been recorded in the erythrocytes of numerous other avian species (e.g. doves, cranes, kites, pheasants, psittacines and passerines) [13, 31–33] suggests that other species of avian-infecting Anaplasmataceae may exist but have yet to be described. This seems particularly plausible in the case of the intraerythrocytic inclusions originally described as “Aegyptianella botuliformis”  and “Aegyptianella minutus” , both of which produce erythrocytic inclusions that are morphologically distinct from those traditionally attributed to Ae. pullorum. Similarly, the Rickettsiales-like cytoplasmic inclusions observed in the erythrocytes of a king penguin (Aptenodytes patagonicus) that died while in care at SANCCOB  appeared distinct from those observed in this study (smaller, finer structure, with pale central vacuoles, more clearly-defined dark purple dots, did not distort the outer margin of the host cell) and likely also represent a distinct (and potentially novel) organism. Future studies on the molecular biology of avian-infecting Anaplasmataceae will therefore be valuable to provide insight into the evolution of these organisms and indicate the most appropriate nomenclature for Aegyptianella. Over the past few decades, tens of thousands of blood smears from African penguins have been examined at SANCCOB. However, because “Candidatus Anaplasma sphenisci” was not known to exist, it is possible that its inclusions were mistakenly interpreted as corresponding to small round forms of Babesia spp., degenerative changes, or staining artifacts. Our results therefore do not necessarily indicate that this is a novel or emerging pathogen, and further studies will be necessary to evaluate its prevalence in African penguins. The vectors of “Candidatus Anaplasma sphenisci” are not known. The soft tick Ornithodoros capensis is a common parasite of African penguins, including in South Africa , and is thus the most probable vector. However, the hard tick Ixodes uriae is also thought to occur on the coast of South Africa and, even though it has not yet been recorded on African penguins, it is a frequent parasite of other penguin species elsewhere . Both O. capensis and I. uriae are shared by a large number of seabird species , including seabirds that breed sympatrically with African penguins such as Bank and Cape cormorants (Phalacrocorax neglectus and Phalacrocorax capensis), Cape gannets (Morus capensis) and Kelp gulls (Larus dominicanus) [38–40]. The potential therefore exists for the transmission of this bacterium to other seabird species. “Candidatus Anaplasma sphenisci” is the first species candidate of Anaplasma shown to produce cytoplasmic inclusions in avian cells. This opens the possibility that cytoplasmic inclusions in avian erythrocytes that had previously been attributed to Aegyptianella sp. might in fact correspond to Anaplasma. It is therefore clear that the diversity and host range of Anaplasma spp. might have been underestimated, and further studies on the molecular biology of avian-infecting Anaplasmataceae will be valuable to provide insight into the evolution and epidemiology of these organisms. We wish to thank the many staff, collaborators and volunteers at SANCCOB, especially Natasha Ayres, Renata Hurtado, and Katrin Ludynia. SANCCOB is supported by a wide range of local and international donors including international zoos and aquaria, foundations and trusts, corporates and individuals. This research was supported by the National Research Foundation and by state and federal supporters of the Southeastern Cooperative Wildlife Disease Study. Gene sequences obtained in this study were deposited in GenBank (accession numbers MG748724 and MG748859). Blood smears and ethanol-preserved aliquots of the same blood sample were deposited in the collection of the International Reference Centre for Avian Haematozoa (IRCAH), Queensland, Australia (accession codes G466205 and G466206). Other relevant data are provided in the additional files. RETV and PAP were responsible for the study coordination. RETV and NJP collected the samples and evaluated blood smears. MJY and LS conducted molecular analyses. RETV, MJY and NJP drafted and LS and PAP edited the manuscript. All authors read and approved the final manuscript. This study was conducted under annual permits from the Department of Environmental Affairs (RES2016/18, RES2017/56) and under the approval of the University of Cape Town Animal Ethics Committee (2014/V18/SCNP2).